(T)he right-wing, tea-party zealots … vision of America isn’t any place I want to live. – Joey Kennedy, who will hopefully be leaving the State of Alabama soon. Yes, Republicans created this crisis because they don’t want theAffordable Care Act, and they’re willing to do anything in their power to defund, delay or gut it — even shut down the government. They like high-profit private insurance and little choice for the hardworking poor. Mr. Kennedy harps that poor people suffer now, but he fails to mention that the middle-class (mostly small business owners) will get stabbed in the gut by the outrageous Obamacare costs. Even some liberals are rethinking this madness. And, considering the Fed fails at everything except power grabs, do you really want them to wield more power, power they were never supposed to have in the first place? 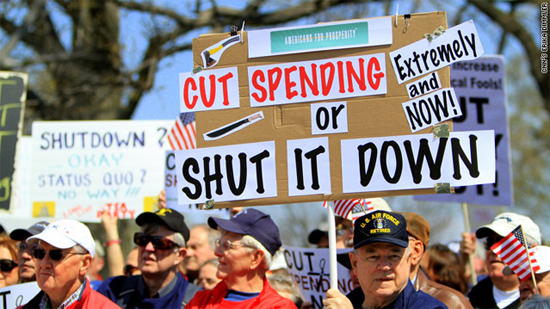 Can and should they continue to function on massive debt and borrowed money? Isn’t a shut-down (an actual one) the logical outcome for an organisation which is mismanaged into oblivion? If you are so concerned with the poor, Mr. Kennedy, we at St. Andrew’s News suggest you do what others do. Rather than legislate, donate. Donate your own money and time to helping the poor. Obama should have pushed a comprehensive Medicare-for-all or a similar universal, one-payer system. Instead, we’re shutting down the government over a half-arsed health insurance law that, while better than nothing …doesn’t go nearly far enough to ensure quality health coverage for all Americans. They only believe in their way or the highway. (A)s long as a substantial number of these ultra-right zealots hang around, our government will remain broken. Off to the gulag with you! Next Are the Feds Cowards?